Jenna is now available inworld and on marketplace, and comes with Catwa applier! Our new body is available in 9 skintones, with two options for chest (natural, cleavage), and including appliers for Slink, Maitreya, Belleza, Omega! New skin, Alice, exclusive for Skin Fair 2019! 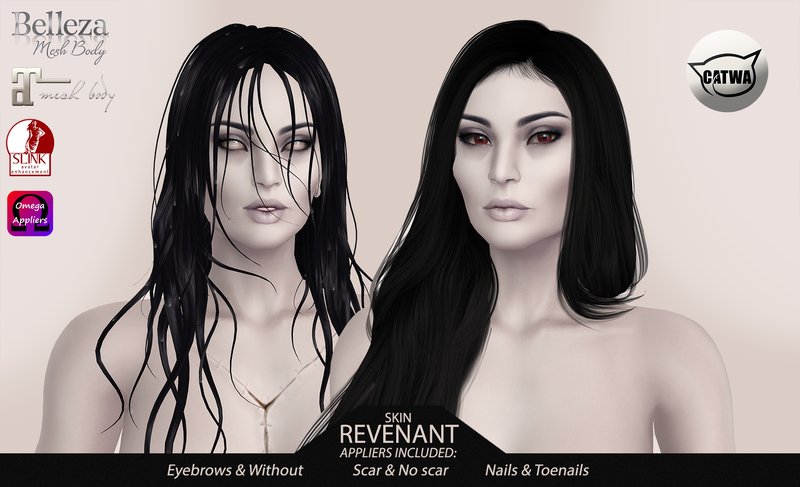 Appliers for Genus head, now available inworld and on marketplace! Finished a collab with NEKROS! This skin and lethorns have arrived to the store and marketplace! LURE: Ethan @ Skin Fair 2018 Preview done with LeLutka/Catwa Victor and Belleza Jake! There are 7 skintones, from lightest to darkest: Pine, Ash, Birch, Maple, Cypress, Alder, Cedar. Head appliers: Catwa, LeLutka, Omega. Body appliers: Belleza, Signature, Adam, Slink, Omega. LURE Rebel Queens Gacha is coming to Fantasy Gacha Carnival, which marks our first gacha and first non-skin goodies! You can exchange Lekku (3. & 4.) into copiable items.